Another cycle in the betrayal of the Lebanese people is underway if we are to believe the media reports. In undermining further the credibility of the Special Tribunal for Lebanon (STL), Hariri junior is revealing a steady learning curve on the Lebanese political gameboard. His prime mentor and advisor is no doubt the Lebanese Machiavelli himself, Mr Walid Joumblatt. The latter had laid the foundation for this turnaround by reflecting a few weeks back on his handling of his own father's assassination back in 1977. He regretted the dozens of Christian casualties sacrified in order to appease the grief of the Druze community and indirectly praised his own wisdom in taking the conciliatory approach towards the Syrian regime. The fact that his ultra-pragmatism did little to shorten the civil war or reduce its devastating effect is brushed aside in favour of a rose-tinted assessment of the Beyk's political performance thus far. Apologies are warranted. (For once I agree with Michel Aoun). Some still have flashbacks of the Cedar revolution with its scarves and flags, its hugs and handshakes, its speeches and anthems. Now, the tenors of the March 14th coalition are urging their audience to relegate these images to the the status of historical archive. The sum result is another generation sinking into the mindset of cynicism and the rejection of politics. Hariri did not have to take this course of action. He would not be blamed for having a suspicion even if he and others have failed to prove it to the Lebanese people. His father's assassination came at a time of conflict with the Baath regime. The operation was well-planned and professionally carried out. It was not the fruit of some unstable mind and the fact that five years later no obvious leads have been identified only confirms this point. Of course Syria is not the only possible perpetrator, but would rationally be included on the list of 'usual suspects' given its past record in Lebanon. The accusation levelled at Syria was political but the first-hand rejection of it is also a political one. What puzzles me is the insistence of some on claiming an empty victory and rejoicing that Hariri now joins the camp of the 'we have no idea who killed a prime minister and a number of public figures since 2005'. We live in a country where politicians get assassinated for their opinions and where others spend incredible time and energy on clearing a past occupier of any responsibility. I can only describe this state of affairs as the communal praise of ignorance. There lies the real tragedy of Lebanon! So... Did not understand what you are trying to get at...! So did Syria or did it not Kill Hairiri and all those brave ferocious politicians who got assassinated?! Or are you just lamenting the support of a big charade called the Cedar “Convolution”?!?! Indeed it was a “Trivialution” based on manipulation and racism… yes… racism against a whole people… and a cowardly approach to solving our very complex regionally entangled political issues. When it was the time to do an honest revolution based on the support of the people and only that… “Machiavellic” pragmatism was the reigning coalition, of whom Hariri senior and Jumblat and all the members of the Cedar “Devolution” who, with the help of the Syrians helped stifle it…! Nothing is going to change… as long as the people of Lebanon… have a Gold Fish memory of our history! I don't know whether the Syrians killed Hariri. Do you? If you have any informations you would like to share, please contact the tribunal directly. My point is simply that the Lebanese need to learn that the entire political body and the structure that supports is corrupt. It will never deliver freedom and prosperity. The March 14th camp sold themselves as an alternative to this but were made of the same cloth. 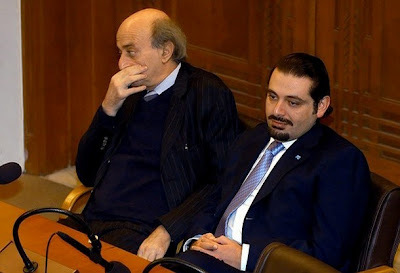 I never had expectations from Hariri and Joumblatt. That is why I am not dissapointed. But I am feeling the pain of those who did.